Oh my goodness! Pitta breads! Well more precisely gluten free pitta breads! Now, I had already done a little reading about gluten free flours even before I made the failure loaf, but I would whole heartedly recommend reading these two great gluten free blog sites if ever you fancy trying your hand at gluten free bread: Gluten Free Girl and Gluten Free on a Shoe String, they’re full of fabulous hints and tips. The pitta bread recipe I used was Paul Hollywood’s own. I scaled back the mixture, only making a third of it (4 pittas) and didn’t include the nigella seeds. I also omitted the psyllium powder as, although this is the gluten replacement to help the bread create a structure, the flour mixture I had bought already included a gluten replacer in the form of Xanthan Gum. I used a brown bread flour also, rather than white. So how did I get on? Well, I can safely say that gluten free bread dough is a million miles different to ‘regular’ bread dough. 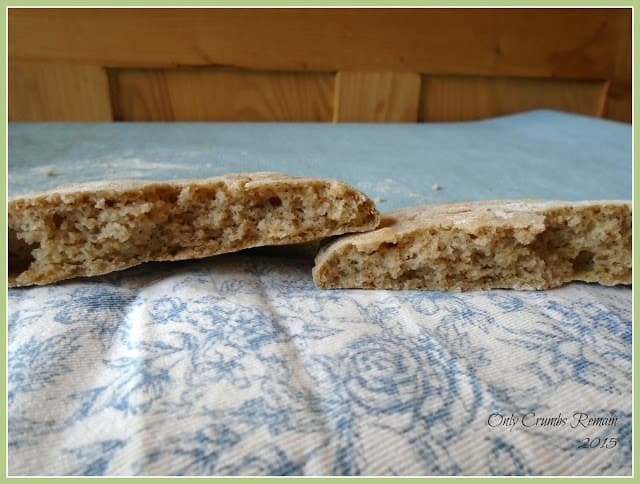 It absorbs the water differently and, by all accounts, one of the tricks is to avoid adding too much extra flour as this is what makes the bread crack. As there is no gluten in the mixture, the dough doesn’t need to be kneaded, but it does require to be worked for a minute or so to bring the mixture together and achieve a shiny looking dough. As the mixture was so wet, I kept it in the bowl during this process. I then used a spatula to bring everything together and keep the bowl sides clean before setting it aside to prove. During the shaping process, I found the dough very soft and difficult to work with. 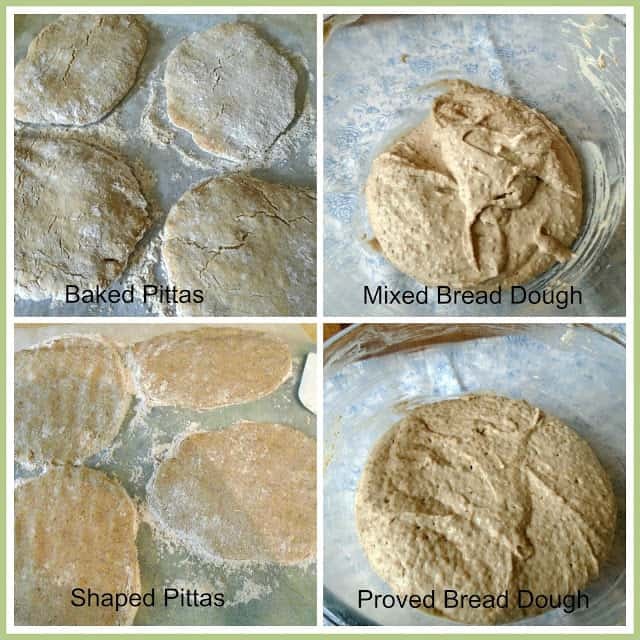 So I tried to reduce the amount of handling by shaping the pittas on a sheet of floured greaseproof paper which I then used to transfer the pittas to the baking tray. This seemed to work quite well. And the result? Well I have to say they tasted a damn site better than the failure loaf, so much so you’d barely notice they were gluten free. Although one or two had developed a crack in the top (apparently due to the inclusion of too much flour), they were beautifully soft and really quite tasty. They didn’t puff up in the oven as much as a ‘regular’ pitta does during the bake, but this said three of the four pittas had the required pocket! Yay! The one which didn’t was slightly thicker than the other three before they went into the oven, (because I had ran out of space on the greaseproof paper so I couldn’t flatten it out further). You know what, I’m so pleased I tried them and I think I may well actually make these again! Time: hands on time about 20 minutes; proving time of at least 1 1/2 hours; 10-14 minutes bake time; plus cooling time. 1. Make the dough. Place the flour into the bowl, followed by the sugar and salt to one side and the yeast to the other side. Use your hand to mix the dry ingredients together. Add the egg, white wine vinegar, olive oil and half of the water. Use one hand to mix everything together, breaking up the egg yolk as you do so. Add more water as you mix it all together. You may not need all of the water, but the dough should be wet and loose at this stage. Keep mixing the dough for about a minute. Put the excess dough from your hand into the bowl and wash your hands. Use a spatula to scrape the dough mixture together into the centre of the bowl. Cover the bowl with cling film and allow to prove for at least one and a half hours until doubled in size. The slower it proves the more flavour the bread will have. 2. Pre-heat the oven to 230c / Fan 210c / Gas 8. Place the baking sheet in the oven to be warming. 3. Shape the dough. Dust the work surface liberally with gluten free flour. Cut a sheet of greaseproof paper the same size as the baking sheet, place on a large chopping board and dust liberally with gluten free flour. Tip the mixture onto the work surface and divide the mixture into 4 equal pieces. If the dough still feels excessively loose, play with the dough in the flour for 10 seconds to make it less sticky. Using the palm of your hand covered in a little flour, flatten the dough out into a small oblong shape. Move it onto the greaseproof paper, laying it where you want it to bake, and continue shaping and flattening the dough into a neat pitta shape. You’re aiming for the dough to be no more than 4mm thick. Wash your hands between shaping each pitta. Repeat with the remaining 3 portions. 4. Bake. Remove the heated tray from the oven and set it down. Lift the chopping board with the pittas on top and slide the grease proof paper onto the tray without disturbing the pittas. 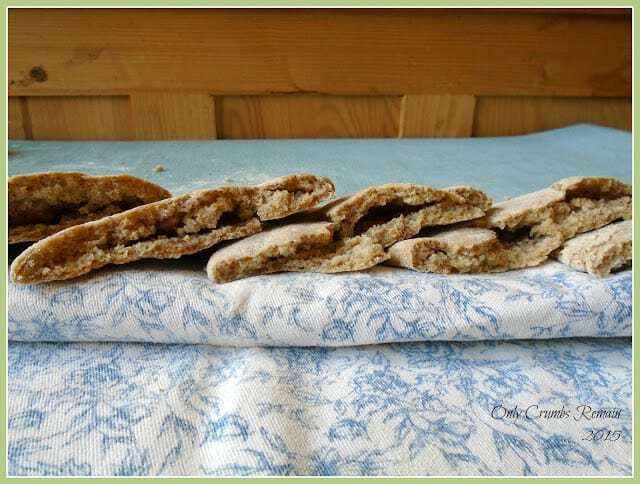 Place the tray in the top half of the oven and bake for 10 – 14 minutes until cooked all the way through and no wet spots are showing on the dough. 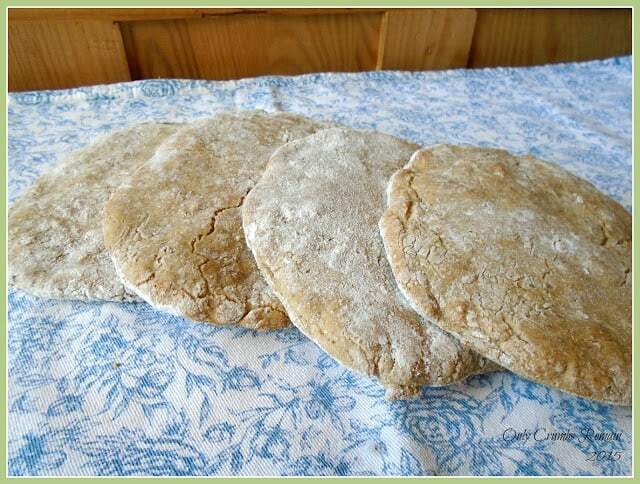 You may need to turn the pittas over after 10 minutes of baking to ensure the undersides are cooked through. 5. Cool. Once baked remove from the baking tray and wrap in a clean tea towel to keep soft until required. Thanks Stacey. The gluten free flour is such a different beast to regular bread flour. I certainly think it will some practice to get them as they should be. Aw thank you Kirsty 🙂 To be honest I didn't realise how difficult they were going to be when I bought the flour as I purchased it before the show was aired. I was still intrigued during whilst watching the show, so knowing I had the bag of flour I couldn't let it go to waste! I have to say gluten bread is so so different to 'regular' bread – both in the making and eating. Thank you Alice, the ice cream roll certainly did look tempting but I wouldn't have been able to make the ice cream with coconut cream as Mr E really dislikes the taste of coconut and although I seriously considered using Almond milk, I came to the conclusion the ice cream wouldn't have been very creamy etc with that. So I made these pittas and a black bean brownie with a nod to the GBBO 'free from' challenge. That's great that you got pockets in most of your pitas!! Total victory, in my book. Thank you Cynthia, 3 out of 4 isn't too bad in my book either, and I think the failed one was because the pitta didn't get flattened enough.